This lively, humorous novel is based on the real life story of Constance Kopp who during the 1920s became a deputy sheriff in Bergen County, New Jersey, while her two sisters ran their own private-detective agency. The story begins earlier in their lives when Henry Kaufman, an arrogant, local factory owner, runs into the sisters buggy. Constances refusal to let him get away with this and the subsequent escalating campaign of intimidation against the Kopps form the basis of this tale. Although the sisters are poor and living on their own on a farm outside the city of Paterson, urged by the relentless Constance they proceed to challenge the right of the wealthy factory owner to dictate their lives. Woven into the story is the mystery of the youngest sister Fleurettes birth, and the story of Lucy Blake, a silk worker who had a baby out of wedlock by Kaufman. During a prolonged silk strike in Paterson some children, like Lucys, were sent to be cared for by "strike mothers" in New York City. After the strike Lucys baby went "missing." This becomes another mystery Constance Kopp is determined to solve. 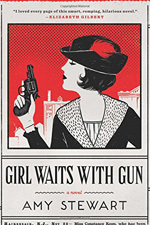 The books title references an actual newspaper headline showing a cartoon of the three sisters carrying guns to defend themselves. Beyond this, the story demonstrates ways women like the Kopps exercised new freedoms in the early twentieth-century. At the same time, it shows the daunting obstacles based on traditional gender expectations which still remained.